A commonly used approach to analyzing stochastic differential equations (SDEs) relies on performing Monte Carlo simulation with a discrete-time counterpart. In this paper we study the impact of such a time-discretization when assessing the stationary tail distribution. 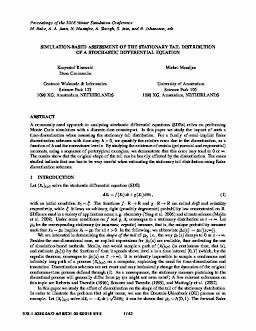 For a family of semi-implicit Euler discretization schemes with time-step h > 0, we quantify the relative error due to the discretization, as a function of h and the exceedance level x. By studying the existence of certain (polynomial and exponential) moments, using a sequence of prototypical examples, we demonstrate that this error may tend to 0 or ¥. The results show that the original shape of the tail can be heavily affected by the discretization. The cases studied indicate that one has to be very careful when estimating the stationary tail distribution using Euler discretization schemes.